Around the world, the arts are being used within communities to address local needs. For such projects to be most effective, program participants must: ensure that their program goals are locally-defined; research which art forms, content, and events might best feed into their program goals; develop artistic products that address their goals; and evaluate these products to ensure their efficacy. The work of the Global Alliance to Immunize Against AIDS Vaccine Foundation in Mali offers one example of how to do this. Cervical cancer rates are five times higher among women in Africa than in the United States, and Mali has the highest rate of cervical cancer in West Africa. Local health authorities are working with international organizations to make the human Papillomavirus (HPV) vaccine available in Mali. Vaccination would have a significant impact on the cervical cancer burden in Mali, yet the success of prevention methods will hinge on raising awareness about HPV and cervical cancer. After completing preliminary studies on cervical cancer and HPV knowledge in Mali, the organization responded to a significant need for community awareness and education through a story-telling cloth focused on HPV and cervical cancer. Using textiles for communicating messages is a common practice in Mali and many other parts of Africa; for example, pagnes (term referring to a length of printed fabric) may feature local proverbs, promote particular political leaders, or mark national events. Textile patterns are produced locally and used to make clothes and accessories worn by men and women. The initiative in Mali centered on a pagne on which the words “I protect myself, I care for myself, and I get vaccinated” are depicted as banners across images of healthy cervixes, fallopian tubes, and uteruses. A background of healthy cells transforms to cancerous cells surrounding HPV viruses, to create a visual narrative connecting HPV infection to the later development of cervical cancer. A key addition to the cloth pattern came from community members: when the imagery and significance was explained during focus groups, women mentioned a specific Malian proverb, “banakoubè kafisa ni bana foura kèyé,” meaning, “it’s better to prevent than to cure.” This proverb was included in the final version of the pattern. Additional preliminary feedback also was incorporated into the pattern; this included color preferences, scale of the design, and changing wording used on the cloth. Image credit: Healthcare personnel wearing the story-telling cloth at a community health clinic in Bamako, Mali. ⓒ 2015 GAIA Vaccine Foundation. Used with permission. The educational pagne was the keystone of a broader program for cervical cancer prevention funded by the Bill and Melinda Gates Foundation. The goal was to maximize screening at five participating community health clinics, educate neighborhood residents, and discover preferences for HPV vaccination. 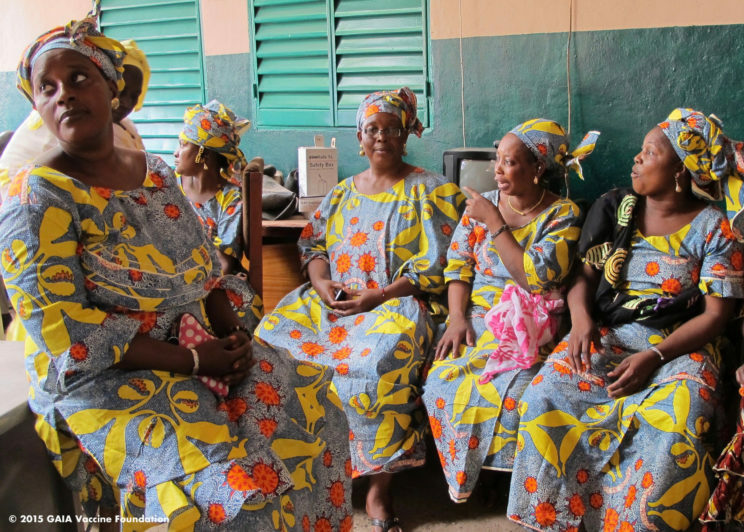 Starting in March 2015, the organization worked closely with the Mali’s regional health department to run a healthcare worker training program to build capacity for cervical cancer screening. A televised campaign launch featured the cloth and healthcare practitioners involved in the initiative. The organization provided midwives, doctors, and outreach workers with enough fabric to tailor two outfits which were worn during community education sessions in community clinics and surrounding neighborhoods. Community health workers used the cloth to help explain HPV and cervical cancer to women, and to encourage women to attend cervical cancer screenings. Local radio station personalities also promoted the availability of cervical cancer screening. Finally, the organization provided screening supplies during the six months of the campaign. The results of the project were highly positive. Some 78% of women who participated in a clinic or neighborhood education session had seen the story-telling cloth, and the vast majority was able to accurately identify the imagery. The organization evaluated the efficacy of the HPV story-telling cloth education campaign on awareness by measuring the increase in screening rates, which showed a dramatic five-fold increase over the same period in the previous year. Interest in the HPV vaccine was high; 92.6% of participants in a survey expressed interest in having the vaccine available in Mali, and 87.4% said that they would vaccinate their daughters. When asked why they would choose HPV vaccination for their daughters, 84% of survey participants gave an answer that related to the story-telling cloth awareness campaign; 73% mentioned “prevention” or “protection,” and 11% responded with the exact proverb that was printed on the cloth. Participants received a bag made from the HPV cloth so that they could help educate others. Through the survey, the organization also was able to obtain information about a number of related issues, such as: which parent would need to give consent for vaccinations, how best to contact parents when vaccination is available, and where people prefer vaccinations to be given. This information was reported to public health officials to help ensure that future vaccination efforts are effective. The Global Alliance to Immunize Against AIDS Vaccine Foundation’s work with textiles and HPV in Mali offers one example of the ways in which people and organizations around the world are using the arts to transform communities. In this case, an organization has drawn upon the historical use of textiles to communicate messages within a community and has developed a new product that meets contemporary needs. This example also shows how organizations can test new products; such tests help program staff to improve designs and ensure that their initiatives have a lasting impact. Featured image credit: Story-telling cloth for cervical cancer prevention. ⓒ 2015 GAIA Vaccine Foundation. Used with permission. Dr. Kathleen J. Van Buren is Honorary Research Fellow for the Department of Music at the University of Sheffield, where she previously worked as Lecturer in Ethnomusicology for ten years (2006-2016). She holds an MA and Ph.D. from the Department of Ethnomusicology at the University of California, Los Angeles. 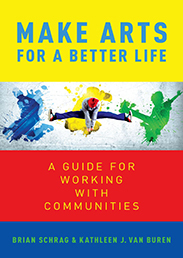 Her most recent publication is Make Arts for a Better Life: A Guide for Working with Communities (OUP 2018), co-authored with Brian Schrag. Eliza Squibb is the co-founder of Z Twist Design, a social enterprise that partners with organizations to create culturally competent communication design for global health and development. She also is an instructor for the Rhode Island School of Design’s Project Open Door, a college access program for urban teens in Rhode Island. She was formerly the executive director of the Global Alliance to Immunize Against AIDS Vaccine Foundation and designed the pagne featured in this post.